skipping rope Archives - Buy Speed Ropes | Skipping Ropes | Jump Ropes for Crossfit, Boxing, MMA. 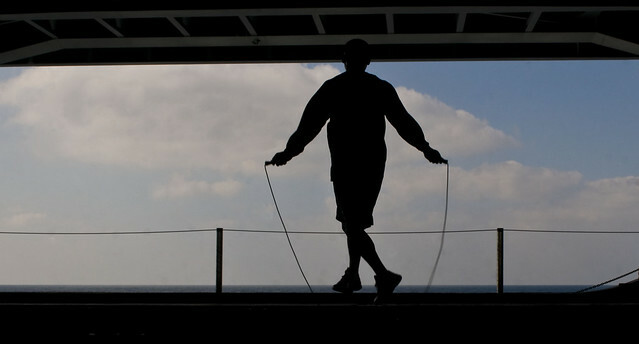 Athletes, Boxers, Crossfitters & gym goers use a skipping rope for a reason. If you learn to skip will be on track for improving your overall health and fitness. Using a skipping rope is by far one of the most effective ways to build your stamina, increase your foot speed & coordination and is also a great way to help build amazing your calf muscles. Skipping can also be frustrating, the reason for this is that it not a natural movement and learning to skip will take practice. We’ve put together a very easy to learn progression program to help you beginners sharpen your skipping skills. There are two main parts to using a skipping rope. first of all you have the swing and then the jump. Below you will see a quick progression guide that will help you on your way to becoming a skipping master. First of all swing the rope over your head and perform one jump, that’s the beginning, now progress on to two sets on jumping twice, then three sets of three jumps & so on. Keep this going until you have reached all the way up to ten sets on ten skips or you are skipping for an average of fifteen to twenty minutes. If you miss or get caught on a jump, just re-set the skill and start again from the previous level. This may be frustrating but in time it will get easier, we promise. You should aim to complete this workout at least three or four times in a week. With this in mind by the end of the second week you will notice your stamina, technique & coordination have improved massively. If you do this practice right, you’ll be well on your way to looking like one of these professional boxers doing 3 minutes round in one go. The whole point of practicing is to get better. For many people this will not be an easy task you must stick with it. So below are the basics of the move. These have been broken down into small chunks so that you can understand the movement easier and learn to control your body, control the rope and put the whole move together to form one (then many) move(s). First of all you will only jump high enough to clear the skipping rope as it is going around. Keep your knees nice and soft/relaxed as you jump. With this, you will need to land on the balls of your feet nice and lightly to minimise the impact on your knees & joints. Use your wrists to swing the skipping rope– in a controlled way, do not your whole arm to control the rope. Keep your elbows tucked in by your side. If you start your jump when the rope is just above eye level, this should be roughly the right time when you are learning. Keep going until this all comes together in one fluid movement. This is a basic guide to help people learn to skip. I hope this guide helps some or all of you budding skippers. The easiest way of explaining exactly what a speed rope is, is its very similar to to jump rope or skipping rope, however the term ‘speed rope’ would explain that this particular skipping rope has been made for speed. The speed rope has a lighter design than a traditional skipping rope ie the handles and the actual rope section, or what would be the rope section of a skipping rope is actually a metal wire. These metal wires are often covered by a coloured or clear plastic/resin. The heavier component parts of the speed rope allows the athlete or user to do an increase number of revolutions during his or her workout. If you are familiar with double or even triple unders, using a speed rope make performing this exercise a little easier. Speed ropes come in a number of different designs and colours, some with plastic moulded handles, some with rubber handles and even with weighted metal handles. They are usually cylindrical shaped and easy for the user of the skipping rope to hold. The colours of the handles are often different, some even have comfortable foam grips, and even come in varying widths for ease of grip or to make using the speed rope more comfortable. There are loads of benefits to your health, fitness & coördination by switching to a speed rope, some of these benefits include offering a higher intensity sessions based on being able to do an increased number of revolutions, improved footwork as you will need to move your feet even faster than normal, and increased stamina.